98 registered members (AdditiveOCD, alphadog, ammolab, 2015_PSD, 53' Stude, 2009Edge, 11 invisible), 1,943 guests, and 28 spiders. Walmart Canada doesn't have the Supertech brand, but instead the "Tune it!" brand. This gear oil sells for CAD$7 regular price, which is quite the deal. I read somewhere that Walmart USA had some labeling issue in the past about identifying as "limited slip" its Supertech gear oil while it shouldn't have been. I plan on using it in a 1998 Yamaha Big Bear 4x4. Front diff is limited slip, rear gear is just a regular gear on solid shaft. Yamaha recommends limited slip oil front and regular gear oil rear. 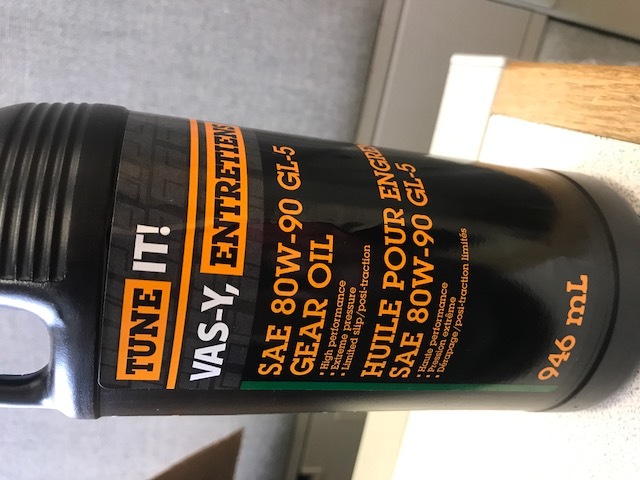 Is this oil too good to be true, $7 for limited slip approved gear oil? All the other limited slip oil I could locally found were synthetic and between CAD$18-22 a quart. Yes, that, isn�t the same as any parallel product at US Walmarts. The ST is 75w-90 synblend and not for lsd. It is not out of the realm of possibility, though at that price. In the US, Valvoline sells lsd gear oil at $7 to $8qt., as does Peak. There could be no harm in trying it. If you find when doing slow figure eights that you get chatter up front, you can simply add limited slip additive to it without wasting it. Most auto parts stores and car dealerships will have a 4 ounce container of it. Generally runs $7 to $8 for the 4 ounces and will convert the fluid to having the correct friction modifiers. If you find the WM stuff not working, you can add this or similar. Gear fluids are changed so seldom pl. consider name brands and synthetics.